This is the second release from the new label, Triangle. They release mass produced CD-R's, instead of ordinary silver (real) CD's. I usually don't display - or write reviews of CD-R productions - but I found it appropriate to make an exception in this case. 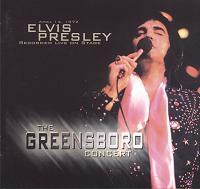 "The Greensboro Concert" features the complete show from Greensboro on April 14, 1972. As most people are aware of, this concert was filmed by MGM as a part of their "Elvis On Tour" production and recorded by RCA for a potential LP release called "Standing Room Only". Eventually only three complete performances from this concert was issued on MGM's "Elvis On Tour". A LP release was abandoned by RCA because of the concerts in Madison Square Garden on June the same year. Later 'Release Me' from Greensboro was included on the MGM video release "The Lost Performances". The rest of the concert has only been available on a bootleg CD called Sweet Carolina from Vicky. This CD featured the complete concert in very good sound. The source for Sweet Carolina was said to be the original "Elvis On Tour" recordings. Triangle also mentions these recordings as their source for this new CD. However, the sound on "The Greensboro Concert" is greatly improved compared to the previous Sweet Carolina. In fact this new product from Triangle hold very high class as far as sound goes. Even though it is in mono, the sound can best be compared with official releases from BMG. It is crystal clear, even and well balanced! Regarding the concert itself, song selection etc.. I refer to a review written by Mark Littlejohn of Sweet Carolina. In general these On Tour concerts are well known by most Elvis fans. Personally I find this Greensboro concert to be the weakest of the 4 shows available on CD, but it is still a good concert. It can best be compared with the concert from San Antonio, April 18, recently released in great sound on BMG's Close Up. A CD with good content and great sound certainly deserves a nice wrapping. Triangle even manages to complete their work with bravura. An eight-page booklet with relevant photos and necessary information is certainly a nice way to present a CD. I wish that other bootleggers and even Follow That Dream would take a look at this product. There might be something to learn! Certainly it should have been released on a real silver CD, but in most cases you can't win 'em all. Even so, bring out more Triangle! © Oven Egeland, Elvis In Norway, September 4 2003.